Arrrrr ye ready to plunder some booty, me super scallywags? Yo ho yo ho! It be Talk Like a Pirate Day all week long! That old sea dog Capn’ Skampy be waiting fer ye and yer crew on Market Street. Raise thee anchor and plunder his shop full of TLAPD Seasonal Rares! 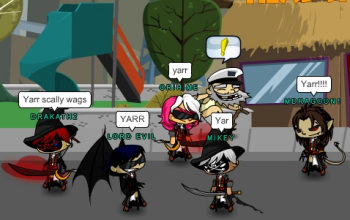 Yaaaaaaaar! 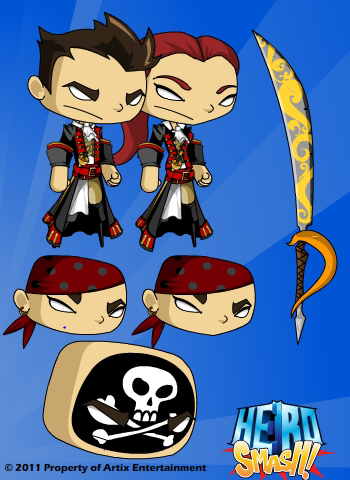 What we’ve got there be thee Pirate Royalty armor, thee Royal Cutlass, thee color custom Pirate Bandanna, ‘n thee Jolly Roger Paint (and one be color custom, too). 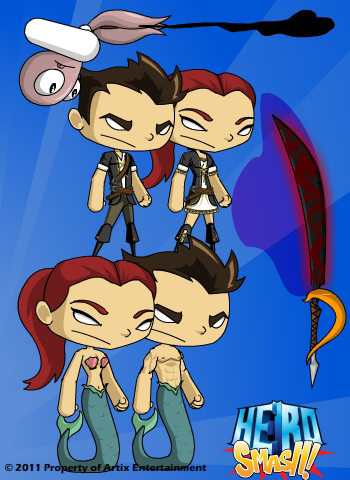 ‘nd up there, me be showin’ ye thee Octo Inker gun, Scurvy Buccaneer armor, thee Cursed Royal Cutlass, ‘nd thee fishy Rapscallion morph! Some of these Seasonal Rares are fer every swashbuckler while others be suitable only fer Upgraded Hearties, and some require a handful of SmashDoubloons. So ye better make sure ye get ye hands (or hooks!) on this rare TLAPD booty ‘cuz ye never know if they ganna be offered ever again! Today’s player suggestion is the Selfless Gift power, inspired by your fellow player Novarian Prince. Selfless Gift allows you to sacrifice your health to heal another player by a great amount over 6 seconds. Such a noble and selfless power can only be used by equally great Heroes. As such, Heroes at level 10, 15, and 20 can learn Selfless Gift from the Hero Spire kiosks. On behalf o’ thee HeroSmash crew, we hope you enjoy thee release ‘n continue to Smash On! Seventeen player suggestions have already been implemented in game: Mystic Blade, Supreme Commander armor, Attack Gloves, Wonderped Bread Helm, Wonderped Bread Armor, Riprap Hook, Cold Blooded, Bionic Cleaver, Shades of Vanquish, Electric Guitar, Bitter Cold, Fiery Wrath, Contra Blade, Aura of Power, Final Blade, Inverted Justice, and the Pulse Crossbow. Reality Rend was inspired by our fellow player Lord Thursday. This power rends reality, shattering your opponent's mind into splinters, causing Insanity. Opponents suffer mental damage and reduced mental resistance for 15 seconds. This power is available in both the Hero Spire and Skull Deep DTU Kiosks, and is learnable by Heroes and Villains at levels 13, 17, and 20. Get your Smash On and start rending some reality! The Shadow War has nearly ended. Which side will Super Death choose? This is it, super folks. The Shadow War is coming to a close tonight. And you know what that means (and if you don’t, I plan on telling yah anyway): Super Death will make his final decision whether or not to align with the Heroes or the Villains. But from the look of things, the Villain War Meter is pwning the Heroes… so one could make an educated guess if they so choose. Find out tonight during The Trials of Super Death finale! How super is this?! You can now level up to 20! Helping Super Death through his trials has taken its toll on you. Trust me—it was super hard for me to complete, and I’m a Mod! Thus, you have undoubtedly earned Death’s respect. And as such, you have earned the right—and the honor—to unleash Shadow Power! Envelope your enemy in spontaneous darkness lowering his chance to hit while draining his health over time. Conjure the forces of darkness to blast forth from your eyes and destroy your opponents. Blow up your opponent with an explosion of supreme shadow power. Summon the power of Super Death unleashing tremendous damage on a single opponent but gradually draining your own health for 15 seconds afterwards. Speak to Astroman to get your new Shadow Powers! See that HUGE gun up there? That’s Event Horizon. And Event Horizon will be going RARE next week, so if you want to own a piece of Shadow War history, you better get it tonight while you still have a chance! It costs 250 SmashCoins, so if you're running low, now is the perfect time to stock up! Click here to purchace your SmashCoin bundle! All these items require a good amount of Shadow Rep, so if you see something you like, you’re going to have to…. Following Super Death’s decision, new Missions will unlock under Twi's supervision that will allow you to grind Shadow Reputation. There are 3 repeatable quests offering 1500 Rep total, and one exclusive Member-only mission that awards a massive amount of Rep! Sweet. 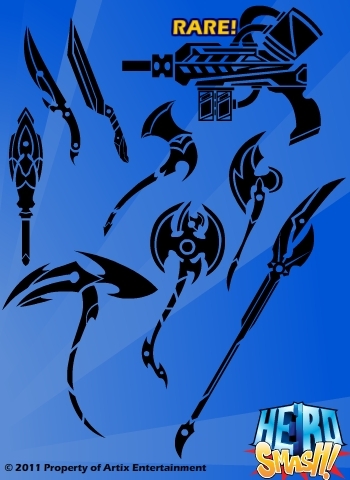 Those Shadow Powers and Shadow weapons are as good as yours now! Good luck my friends, and SMASH ON!